American studio wHY has won a competition to design a new events pavilion overlooked by Edinburgh Castle, with plans for a series of glazed pavilions topped by wave-shaped roof gardens. wHY partnered with Edinburgh office GRAS on its design for the £25 million Ross Pavilion, which was selected ahead of proposals by six other teams, including BIG, Adjaye Associates and Sou Fujimoto Architects. The winning design, called Butterfly, proposes pavilions with a gently undulating terrain extending over the top, to ensure views of Edinburgh Castle remain the main focal point of the gardens. 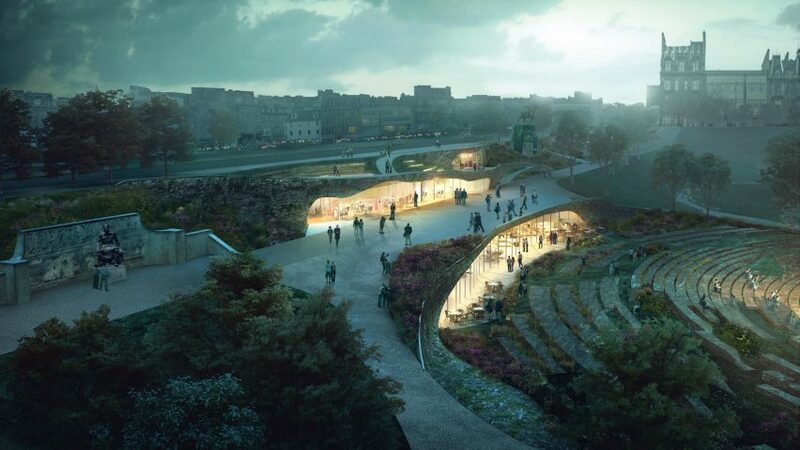 This pavilions, which will house a visitors centre and a cafe, would be topped by an undulating promenade that provides access to Princes Street, one of the city's main shopping streets. The Ross Pavilion and West Princes Street Gardens competition was organised by The Ross Development Trust and Malcolm Reading Associates. It asked entrants to design a pavilion to replace an existing bandstand within the gardens, to host key events in Edinburgh's calendar including Hogmanay celebrations and the Edinburgh International Festival's closing fireworks concert. The winning team also included Groves-Raines Architects, Arup, Studio Yann Kersalé, O Street, Stuco, Creative Concern, Noel Kingsbury, Atelier Ten and Lawrence Barth. The jury was unanimous in its selection of the design, praising it as "a beautiful and intensely appealing proposal that complemented, but did not compete with, the skyline of the city and the castle". "They demonstrated an impressive collaboration which respects and enhances the historical context and backdrop of the castle and the city, whilst creating new heritage and increasing the green space within the gardens," said jury chair Norman Springford. "All of which were key aspects for us all and respected the importance of the space within a world heritage site." The jury also specially commended Sou Fujimoto Architects and William Matthews Associates for their team's design, which featured a ramped pathway encircling a public green. New York- and Los Angeles-based wHY was set up by Kulapat Yantrasast in 2004. Yantrasast and the practice's landscape design director Mark Thomann led the project for the Butterfly pavilion. "wHY is built around an ecology of disciplines, the convergence of ideas, experience, nature and people," said Yantrasast. "The Ross Pavilion and West Princes Street Gardens represent this convergence and this was the perfect ground to further our approach to design." The firm also recently completed work on the Marciano Art Foundation in Los Angeles and Grand Rapids Art Museum in Michigan. Plans for the Ross Pavilion and West Princes Street Gardens will now be open for public consultation, with construction works expected to begin in 2018.